While attending the Atari World show in Anaheim, California, in late April, I met a most charming young lady whom a great many attendees of the show did not get to see. Many expected her to be there when the show opened, but, alas, she was nowhere to be found. However, the evening after the first day of the show, in a private suite in the Disneyland Hotel, this shy young lady made an appearance. She was very attractive; small, a bit on the short side, wider than she was tall, with ebony skin as black as Darth Vader's heart. She was beautiful! I am referring, of course, to Stacy, Atari's laptop ST computer. The one and only prototype was brought in so that the select few in that suite could get a sneak peek at this latest entry in the ST family. And, although Stacy did appear at the show near the end of the second day, users were allowed only to look, not touch. Fortunately, no such restrictions were in place in the hotel suite the previous night. 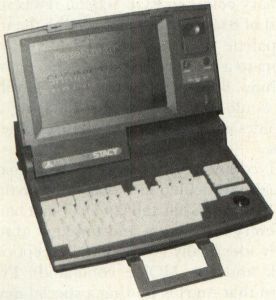 The Stacy prototype is not immediately recognizable as an ST, the most obvious difference being the radical departure from the Atari-gray color scheme. Stacy is sleek and jet black, and features a hinged top that contains the screen and covers the keyboard when the machine is closed. The screen on this prototype was an amber liquid-crystal display, but we were told that the final machines would feature blue- on-white backlit supertwist LCD displays (which are nice). The LCD displays the 640 × 400 monochrome resolution nicely. Understandably, but unfortunately, this LCD screen cannot display color. To the right of the screen were volume and contrast controls, and just above those was a small "clipboard" clip that allows you to hang notes next to your screen. The keyboard was of standard ST gray-white color, but the keys actually had a better feel than those of the Mega ST. The main keyboard is full size, but the function, cursor pad and numeric pad keys are all miniaturized. The keyboard was angled perfectly for laptop typing although the angle feels a little wrong when you have it on a table in front of you. Since the computer is designed to be used on the go, when even a desk or table is rare, using a mouse might prove inconvenient. The route Atari chose was to provide a small trakball (with two buttons) to the right of the keyboard and just below the numeric keypad. The prototype featured a battery pack (said to allow the machine to run for about four hours on a charge), adapter (in the event you have access to an electrical outlet) and two double-sided 3.5-inch floppy-disk drives. It was stated that the final models will be offered in two configurations, the first with a single floppy drive, the second with one floppy drive and an internal mini 20-megabyte hard disk. Both models will come with one megabyte of RAM and TOS 1.4 on ROM (the prototype was running TOS 1.2). Except for the miniaturized accessory keys on the keyboard, Stacy could be used just like a 1040ST. The prototype featured all of the ports found on a standard ST: MIDI IN and OUT, printer, modem, DMA, monitor, cartridge. It also featured both mouse and joystick ports so users won't be forced to use a trakball if they want to use a mouse (a switch is used to select between them). Removable panels covered many of the ports, although I overheard someone say all ports would have such panels in the release models. My biggest surprise came when I popped off the largest of these panels, on the left side of the machine, and found the 64-pin processor bus connector, usually only found inside the Mega STs. And how did she run? Very nicely, as far as I could tell. There wasn't much software on hand at the suite, so I couldn't put Stacy through any hard paces. At first I found the screen updating on the LCD a little too slow and difficult to look at, but I got used to it in a hurry (the final screen will be better). Everything seems to run at normal speed. The one thing that bothered me was talk of a name change. If they're going to do it, it will have happened by the time you read this. I'll be disappointed if they change the name to "ST Laptop" or "Portable ST," because for once Atari has a computer with a name—and it's a friendly one. As for price and availability, the floppy-disk-only version of Stacy is planned to retail for $1,495. I did not get a price for the hard-disk-equipped model, though I have heard it will be in the $2,500 range. The first Stacy machines are expected to ship in August, but knowing Atari's policy on marketing new products in the US. . .don't hold your breath. For years rumors have buzzed within the Atari community that the successor to the current ST line was something referred to as the TT. 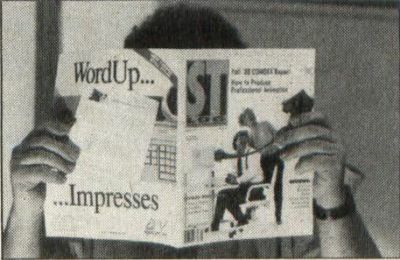 ST stands for Sixteen/Thirty-Two, referring to the 16/32-bit Motorola 68000 microprocessor; so what does TT stand for? Thirty-Two, as in 32-bit microprocessor, and now specifically for the Motorola 68030. The 68030 is, of course, a more powerful and much faster chip than the 68000, used in the current STs, so the TT will consequently be a more powerful piece of hardware. Beyond the name, what do we know about the TT? Some rumors claimed to be fact have been circulating around the Atari community. I've gathered the most reliable of these, but remember, Atari has changed its mind more often than I can count, so even if these rumors are true today, they may be wrong tomorrow. The TT will be offered in two models—the standard TT and the TTx. Both will feature a 68030 running at 16 megahertz, two megabytes RAM, and will run under TOS 1.4 and offer all the standard ST ports and connectors. It will also have internal card slots for expandability. The expansion slots will be 32-bit VME bus connectors (as used in Sun and other workstations), allowing non-Atari cards to be utilized. VME has been a standard expansion bus for many years, so many boards exist that would potentially be plugged into the TT "as is." The TT may also feature SCSI and ASCI hard-disk interface ports. The TTx differs in that it may have more expansion slots, an internal hard disk (perhaps 40 to 80 megabytes), an Ethernet networking port and will run AT&T's Unix System 5.3 with X-Windows, in addition to TOS 1.4. Unix is provided to make the TTx more attractive to businesspeople as a potential workstation, and the Ethernet capabilities will make it easier to integrate TTx computers into existing networks than is possible with the ST series. Sound capability is unknown, though graphics seem a little more concrete. All the usual ST graphics modes are supported in addition to "boosted" low- and medium-resolution modes. The boosted low-resolution screen offers 256 colors at once (320x200 pixel mode), and the medium-resolution screen allows 16 colors at once (either 640 × 400 or perhaps a 640 × 480 screen). A new super-high-monochrome mode has been added as well, resulting in a 1280 × 960-pixel display (which will require a special monitor). In addition to this, the TT rectifies a deficiency in the ST, giving each of the primary colors in RGB sixteen levels instead of 8 (as on the ST), bringing the total palette up from the ST's mere 512 colors to a more respectable 4,096 possible hues. Beyond that, even better graphics would be possible by plugging a graphics card into one of the machine's slots. ST compatibility seems to be a goal, though a difficult one to obtain due to the fact that the 68000 and 68030 do not handle every instruction and function absolutely identically (such as the exception stack and the MOVE command). I've heard that Atari is putting a special new system variable into the TOS that will be in the TT, which will allow programmers to check which processor the machine is running so the software will be able to compensate for the differences. Expect a lot of updates to current ST software when the TT ships! And the price? Expect the TT to run about $2,499, and the TTx to be closer to $5,000. When? Atari says soon, but I'll be surprised if the TT machines materialize before Christmas.